Apr02 Comments Off on Month of My Dear Hamilton Celebrations! Month of My Dear Hamilton Celebrations! In the Richmond, VA Area? Join Laura on April 13! 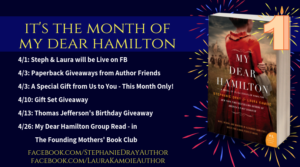 Note especially the *TEN* giveaways of our author friends’ books starting tomorrow and our group read of My Dear Hamilton on April 26 in our Facebook Founding Mothers’ Book Club. 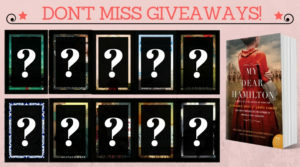 If you haven’t read the book, now is the perfect time to do it so you can join in the discussion!